The 10th Medical Group's Anesthesia Element Chief was one of six luminaries recently recognized for the 2014 Florence Nightingale Award for Leadership in Clinical Innovation during a banquet in Colorado Springs. Maj. Adeleke Oyemade, a certified registered nurse anesthetist and flight nurse here, was honored March 14 for his lifesaving care while on the Tactical Critical Care Evacuation Team in Afghanistan, and for integrating a compact portable oxygen generator device to treat Air Force casualties in combat. Oyemade, a native of Chicago, competed against 27 nominees for the award and will be considered for a Nightingale Award from the Colorado selection committee in May. "It's a great honor to be recognized by my peers, especially for this type of work that really benefits our deployed men and women in combat zones," he said. "This type of innovation can have a valuable application to en-route patient care stateside." Oyemade was part of a high-performance team tasked with formulating a device to provide point-of-injury care to casualties on the battlefield, and to augment oxygen supplies at harden-fixed facilities. "Presently, oxygen is not being delivered to casualties on the battlefield at point-of-injury," he said. "The only sources available to ground medics would be cylinder-compressed oxygen, which is too heavy to carry around for their day-to-day missions, and would be an explosive hazard if the tank were to be struck by a stray bullet." Oyemade said the idea is to create a small device that could manufacture its own oxygen, no need for refill logistics or storage of empty containers. "Currently the project has been submitted to the civilian industry for prototype design," he said. 10th MDG Perioperative Services Flight commander Lt. Col. Lisa Cole nominated Oyemade for the award. She wrote in her letter of recommendation, "Major Oyemade's passion and dedication while facing challenges of en-route patient care have proven invaluable to both military and civilian flight nursing." "I have the honor of working with Major Oyemade and witness his dedication to the mission, creative thinking and tenacity in addressing the challenges of en-route and anesthetic patient care on a daily basis," she wrote. "His knowledge of physiological changes, aero evacuation capabilities and technology have provided a road map for the future of en-route patient care and ultimately increased the survival rate of traumatically injured patients." Oyemade participated in 150 combat missions and delivered in-flight care to over 200 patients with blast injuries, traumatic amputations and gunshot wounds in Afghanistan. Last year he was awarded a Bronze Star for his efforts there. 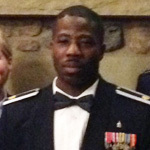 "He (Oyemade) provided in-flight lifesaving care including placing definitive airways, administering blood products and performing needle decompression," Cole wrote. "The foundation laid by Major Oyemade's team will have a remarkable impact on the future of aero evacuation nursing." The Nightingale Awards event was founded in 1985 to honor nurses who best exemplify the philosophy and practice of Florence Nightingale, the 19th century nursing pioneer, who epitomized the art of helping people towards their optimal health, according to the Colorado Nurses Foundation. Most people think of the Academy as an academic installation - they forget about the clinic and the valuable work done there, Oyemade said. "There were two other members from the 10th MDG also nominated for this award, which highlights the extraordinary focus on delivery of evidence-based patient care done at the Academy," he said. Oyemade joined the Air Force in 2000 and has been stationed at the Academy for three years. "I enjoy working with our anesthesia care team and surgical group," he said. "We have some of the most dedicated nurses, technicians and physicians here."